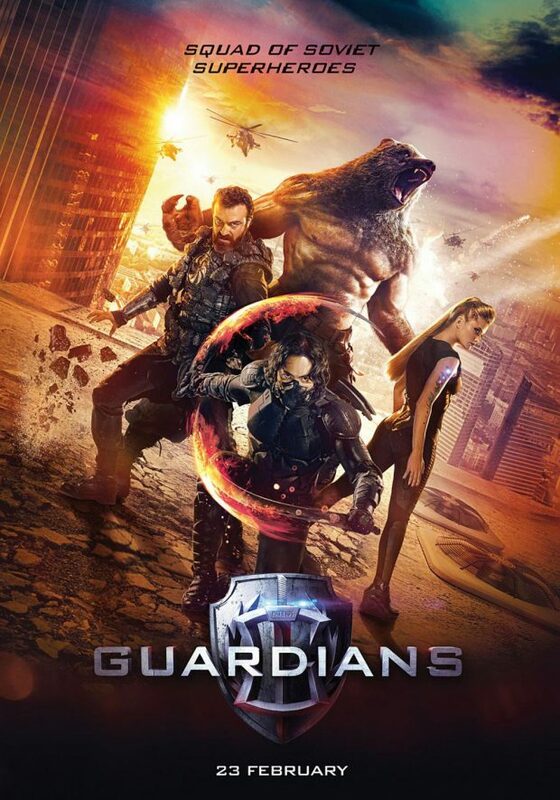 Russia delivers their own take on the superhero team-up movie with Sarik Andreasyan’s Guardians. The story here is fairly simple. A villain attacks and the Russian government decide to dust off a Cold War project that provided them with their own superheroes. At their disposal they have Ler, a man who can control rocks (Sebastien Sisak), a man who can transform into a bear named Arsus (Anton Pampushnyy), a man with super speed and is skilled in combat named Khan (Sanzhar Madiyev) and a woman who can turn herself invisible named Xenia (Alina Lanina). Together they work together to defeat August Kuratov (Stanislav Shirin) who has the ability to control any machine he comes into contact with. This film does an excellent job jumping straight into the action by setting up the characters and the situation as quickly as it can before delivering an onslaught of wonderful insanity that is genuinely a joy to watch. It’s immensely entertaining to see a bear wield a Gatling Gun or someone fashion a battle suit out of available rubble. There are so many visual touches that are competently handled and fun to look at. There isn’t an awful lot of action in the film when all is said and done but it’s used very well when the set pieces arrive. None of it reinvents the wheel in terms of superhero action but there’s no real need to do so. It probably wouldn’t surprise anyone that this film is very thin on characterisation but the lack of depth doesn’t drag it down any. I did find it difficult to invest in any of the characters but an attempt was made to give some of them an emotional hang up to overcome be it a loss of memory or fear of fully embracing the animal side. They are simple character arcs and they don’t really get resolved but it delivers a little more to the members of the team than simple vehicles to enable the action. It may be a translation issue but the dialogue in these scenes is utterly ridiculous yet taken seriously by the cast. It’s actually really entertaining to watch and thankfully the subtitled dialogue never interrupts the flow of the story. Some notable issues plague the film outside of the thin characters. The super powers are depicted very inconsistently and there is a point in the film where they are given equipment that supposedly enhances their abilities but that doesn’t come across as clearly as the film needs it to. It also culminates in a really weak confrontation with the main villain where the heroes defeat him in an anticlimactic fashion. None of this stops the film from being fun but they do stand out as being problematic. An immensely entertaining time at the cinema that provides some excellent action, an easy to follow story and a world that isn’t complicated to understand. The heroes themselves are really thin characters but the lack of depth doesn’t drag the film down too much. There are some attempts to deliver emotional hang ups to be overcome but they remain unresolved by the film ends. It might be a translation issue but the dialogue in these scenes is laughable yet taken seriously by the actors which makes them all the more entertaining. Some notable issues plague the film such as the inconsistencies in how the powers are depicted and a really weak final confrontation with the main villain. Despite that this is a lot of fun and deserves to be seen.